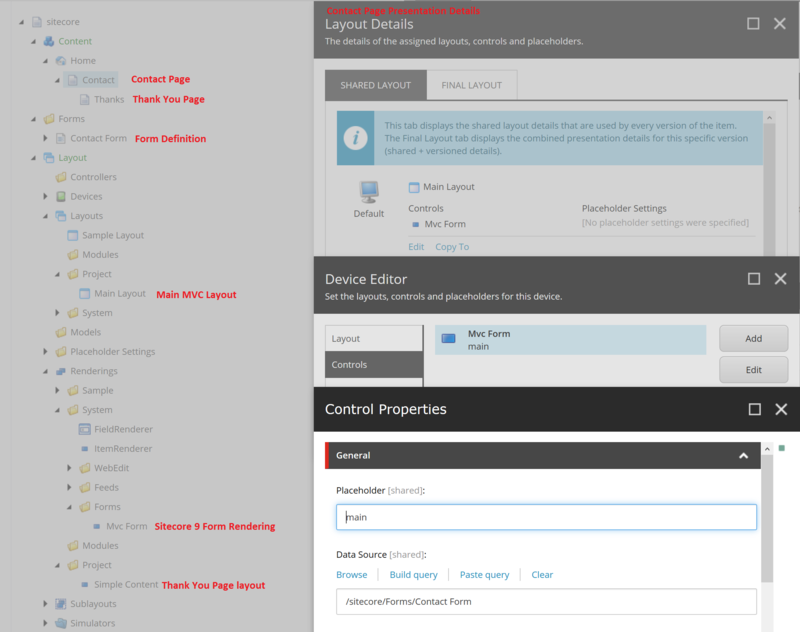 With Sitecore 9 we finally received completely redesigned Forms module, with convenient drag&drop form builder app. Let’s check how flexible it is, by integrating with well-known Bootstrap toolkit, which gives responsive grid system and custom styling for our form. Input fields are marked with “form-control” CSS class. Elements related with one field (label, input, validation) are placed inside one block element marked with “form-group” CSS class (elements with “form-group” class can be used for grid system by adding “col-*-*” CSS classes). To make grid system work properly we also need to add “row” CSS (e.g. to form element) and “container” class, which usually is used in main layout outside the form. With new Forms module we can assign all needed CSS classes to “CSS Class” fields inside form elements properties. 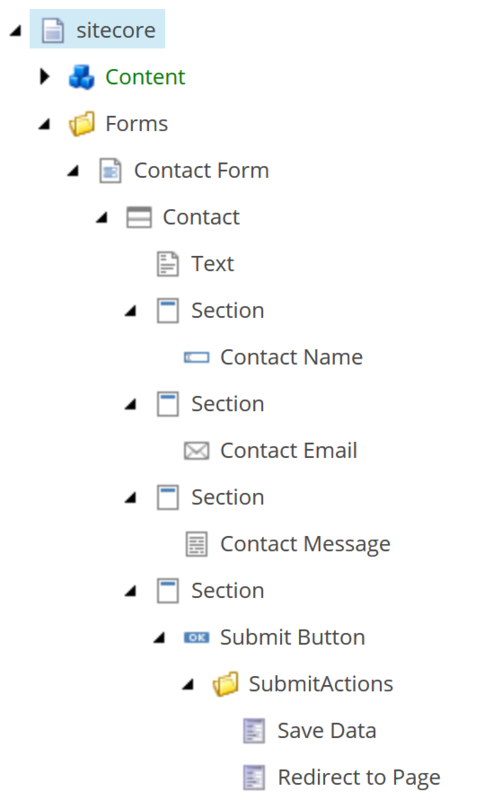 To mimic “form-group” blocks we can use Forms Sections, which are rendered as simple HTML div. Mind that described code is for clean Sitecore 9 and Bootstrap 3. For Bootstrap 4 some changes are needed, like “hidden” CSS should be replaced by “d-none”. After saving the form, you should see new node in your content tree. 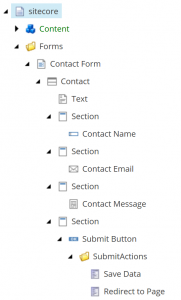 Take a look at these to check how simple new Forms items are. 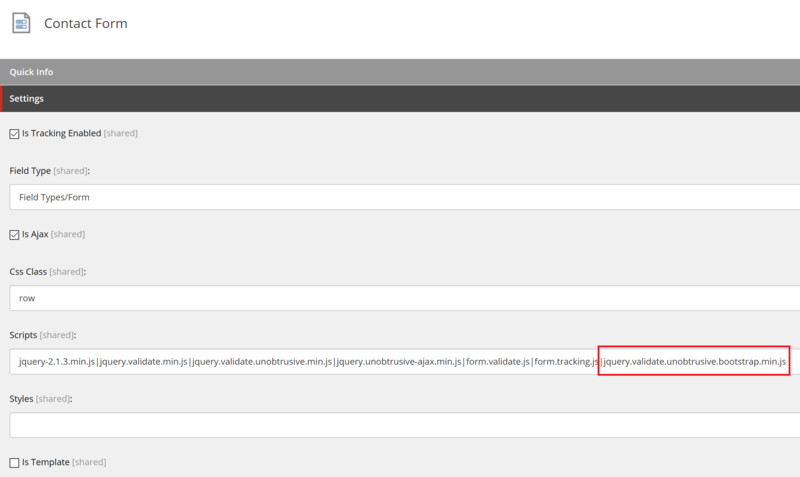 If you open root form item, you may notice that Forms uses jquery.validate scripts for the validation. To integrate it with Bootstrap we can use jquery.validate.unobtrusive.bootstrap script. After downloading, place it in you Sitecore Website folder, under following path \sitecore modules\Web\ExperienceForms\scripts\jquery.validate.unobtrusive.bootstrap.min.js. Afterwards we need to point to this script in our form item. Just add it, separated with pipe (“|”). It is worth noting that, the scripts reference will be rendered only on pages containing our forms. <link rel=”stylesheet” href=”//maxcdn.bootstrapcdn.com/bootstrap/3.3.7/css/bootstrap.min.css” /> – bootstrap styles file from CDN, but you can use your local file. <main role=”main” class=”container”> – bootstrap container element. Next we select this page item in “Redirect to Page” action in our Form definition in Forms Editor app. Finally we can publish all items and test our Contact page. 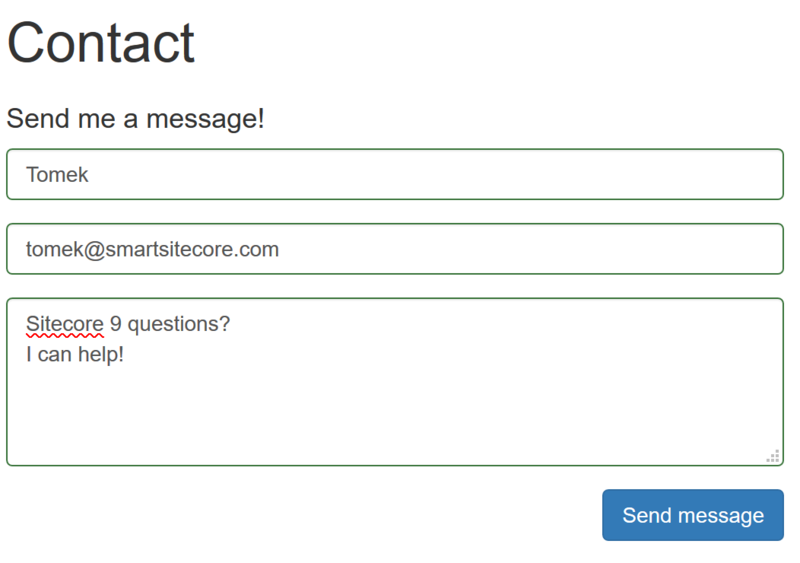 When trying to submit the form with errors, we should see validation messages with Bootstrap styles.